Sometimes it is better to show up late. I walked into the third annual Headphone Festival at the Rochester Art Center after it had begun and was immediately aware of the strange social space this event creates. The first floor atrium was divided in two, columns in the middle of the space wrapped in chic black plastic, separating the performance space from the galleries. On the other side of the plastic the room was dim and silent as dozens of people arrayed in chairs and couches, their headphones all plugged in to jacks at their tables, their gaze transfixed by images on a video screen behind the tables where the performers were set up. The silence led me to think, momentarily, that I wasn’t late at all, and that the performances had yet to begin. Of course, it didn’t take long to remember that the event was only happening for those who were plugged in. Despite this realization, the silence itself was somehow more tangible than the experience in the audience’s headphones, leading non-participants and latecomers to behave as though entering a library, tiptoeing through the room as quietly as possible, whispering, as though the smallest sound might interrupt someone’s headphone experience. I found a seat at a table near the front, noisily. As I rummaged through my bag to find my headphones I continued feeling compelled to be as quiet as possible, though I was surely the only person in the room who could hear. Finally I plugged myself in and could join the event. Oddly, to participate I had to leave a social space and enter a private space. With my headphones on I was in my own bubble. The sound quality was clear, with some interesting things happening in the stereo field. The music itself, however, seemed somewhat run of the mill: ambient electronic chill-out music. Pleasant enough, but I was somehow expecting something that would demand more of the listener, or engage more thoroughly with the strange situation the headphones created. It was unclear why music like this couldn’t simply come out of the PA speakers sitting at the front of the room, waiting for the late night dance party to begin. As I waited for something more interesting to happen I realized that the headphones exerted a certain kind of pressure. I was getting antsy. I felt tethered to my table. My ears were too warm. I wanted to get a beer. I felt like wandering through the galleries. Of course, if I got up to do any of those things I would no longer be listening, even casually. Worse yet, as I walked through the silent room I would somehow be signaling to the audience and performer alike that I was not interested. I decided to get a beer and wait until the end of the performance to visit the upstairs galleries. In the galleries was an exhibition entitled Roman Signer: Works, described as “one of the largest and most comprehensive exhibitions” of the Swiss artist’s work to date in the United States. Signer’s work is deceptively simple, consisting of everyday objects arranged in unusual ways, with poetic, humorous and thought-provoking results. Bicycles and bicycle parts abound, perhaps a nod to Marcel Duchamp and Signer’s dada lineage. As I made my first pass through the galleries I was reminded of Arthur Danto’s phrase “transfiguring the commonplace.” Every work here could be described this way. The first work to stop me in my tracks and make clear that these were no mere one-liners was Bar, an installation featuring six large fans lying on their backs on the floor, suspended above which were six whiskey bottles lazily rotating in the breeze. The effect was beautiful, dreamlike, evocative of nothing so much as the tipsy euphoria that suspends reality, if only temporarily. I could have looked at it for hours. However, at this point I realized another strange artifact of the Headphone Festival; there was no way for me to know if the next performance had started. So, I headed back down to plug back in. Back in my audio bubble I found my mind wandering, considering the untapped potential of this strange social situation. Once again, the music was clear and played with some mild stereo effects, but nothing seemed to exploit the social space the event created. I found myself wondering what the real advantage of the headphones was, other than giving each audience member a private experience, ensuring the clarity of the audio and forcing audience members to pay attention. I wondered if it might be more interesting if this solitary experience was exaggerated. Perhaps we should all be sitting in cubicles, perhaps the event should happen online. I thought, too, that if this experience was inherently personal perhaps I should have more agency and involvement. Why could I not mix and pan the sounds myself? What if my movements through the architecture changed my auditory experience? What if the other audience members somehow changed my experience? What if this apparently personal space in the public sphere was shattered somehow? When were the artists going to do something that pushed at the limitations they had been given? After the next two performers had finished there was a brief panel discussion with the curator and performers, and I hoped that this might help answer some of my questions. Curator Scott Stulen discussed the genesis of Headphone Festivals, which developed in Europe as a response to noise ordinances. A clever and creative response, I thought, but that didn’t quite explain why one would exist where noise ordinances were not a problem. Most of the questions from the audience seemed to address technical issues, equipment, software, and the musical sounds themselves. This forced me into the uncomfortable position of having to ask a question. This is unlike me. Still, I wanted to know what the artists thought: outside of the audio clarity, and especially given the social situation created, what is the advantage of a headphone festival when there are no noise ordinances to get around? Scott was the first to respond to my question, honestly and somewhat bravely admitting that as a curator one is always seeking novel ideas, and that this was an appeal. I was more disappointed by the artists’ responses, which all seemed to be about the audio experience, and that the headphones ensured the audience heard the music as they intended. One performer mentioned the greater possibility of playing with stereo effects, though I think these must have been lost on the many couples sharing a pair of iPod buds between them. Several mentioned the more private, contemplative space the headphones create. The devil’s advocate in me wondered, again, why that would not be true if this even streamed online, or for that matter, if I had a CD of the music presented? It seemed ironic, too, that they were simultaneously excited about complete artistic control, while suggesting there was something empowering for the audience here. I felt that the performers were somehow missing some of the potential of the situation. With a break in the music I headed back to the galleries, and became acutely aware of how many of Signer’s pieces seemed to be about potential, with sculptures that either embodied a frozen potential for action, or worked somehow as an index of an action that had already taken place. In Bulletproof Umbrella a red balloon is protected by the titular umbrella, leaving the viewer anxiously awaiting the shot; in Tunnel a gun lies on the ground, pointing through a tunnel created in a rug, with a target on the wall, again pregnant with anticipation. Two of the bicycle works suggest actions that have already taken place. In Bicycle and Wooden Beams the front wheel of a bicycle is lodged in a pile of 2”x2”s, displacing the center beams by a few inches, a futile and pathetic battering ram. 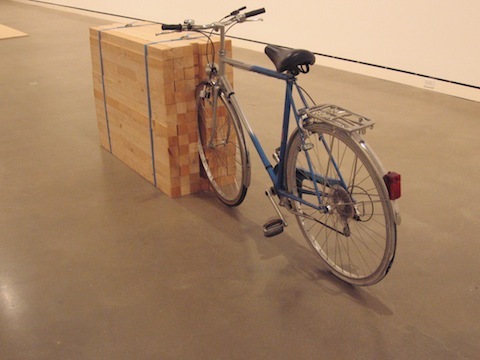 Bicycle with Yellow Ribbon consists of a wooden shipping crate (the perfect size for a bicycle), wrapped in a yellow ribbon, which connects to a spool attached to the rear of a bicycle leaning on its kickstand nearby. This immediately brings to mind the image of Signer riding his bicycle around its crate, somehow capturing its captor, as well as the effort and costs of the journey the bike took from Switzerland. In the two pieces each entitled Wheel, potential is frozen in place. In the earlier iteration a bicycle wheel is lodged in cement, absurd and useless. In the more recent version, a wheel is lodged in a brick of ice, kept inside a freezer. The wheel is locked in place, it s potential for movement stalled, but only temporarily, as the ice may melt leaving the wheel free to fall or roll. Another theme throughout Signer’s work was energy, specifically the transformation of energy into action, and how much energy it takes to make a small change occur. This was clear in Bicycle with Wooden Beams, as well as the huge freezer preserving the second Wheel, but clearer still in the video pieces Office Chair and Dot. In Dot the artist sits before a blank canvas at a plein air easel, paint brush in hand, while a fuse behind him burns. Eventually a firework explodes, startling the artist, who lurches forwards, leaving a dot on the canvas, the indexical remnant of the performance. In Office Chair Signer sits in a typical swiveling office chair, a firework in each hand. As the fireworks go off, spewing sparks and smoke, the chair spins several times and then comes to a standstill, a pathetic seeming reaction to a huge investment of energy. Outside of the wit present here, there is also a timely political reminder of how much energy we use for the most mundane activities. This was most evident in Solar Suitcase. In this work a suitcase covered with solar cells sat on the floor, illuminated by a large photographic lamp. A wire led from the suitcase to a tiny flashlight bulb, whose dim light was the apparent end result of this energy transfer. This work was simple, humorous and thought provoking all at once. Back at the headphone festival the final performer of the evening finally did something with the potential of the public/private space the event set up. Bryce Beverlin II was the first non-electronic performer of the evening, and I was initially skeptical about how a closely miked acoustic performance would translate to the headphone experience. Beverlin sat on the floor, surrounded by cymbals, cups, and a handful of other quotidian objects. To begin, he crumpled a piece of plastic wrap in front of the microphones, moving it left to right, playing with the strong stereo field of the headphones. Unlike the previous electronic panning, however, this had an element of strangeness; we could see that he was moving the plastic no more than 6 inches left and right, yet the sound moved from one stereo extreme to another in the headphones. The sound, too, was surprising, louder, more complicated and frankly more irritating than standard crinkling. As Beverlin began playing the objects on the floor with drumsticks their sounds, too, were transfigured by the close miking. Finally, the audience’s private audio space was invaded, as Beverlin began letting loose vocal murmurs, grunts, moans, gulps, slurps and breaths. At full volume in the headphones, seemingly happening in the center of one’s head, this was deeply disquieting and served to make the confluence of private and public space much more strange than the previous performers had. With this taste of the possible potential of the Headphone Festival I found myself looking forward to next year, and hoping more artists will rise to its challenge and push at its boundaries.